If you want to live amongst the clouds, where the grass seems greener, the sky seems bluer, the mountain views seem endless, and the people are friendlier, Yonahlossee is calling you home. 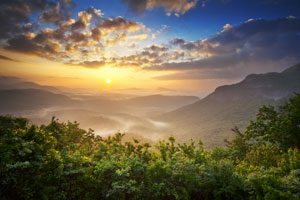 This premier North Carolina resort is “a natural place where families gather, couples celebrate, and lovers of the outdoors thrive.” Right in the heart of the Blue Ridge Mountains, at about 4,000 feet above sea level, this community offers convenient access to all of the High Country along with an escape from the hustle and bustle. Resort features range from award-winning tennis amenities to the most helpful guest services. Homeowners and guests agree, Yonahlossee is unlike no other. Their gracious accommodations and personal attention are enough to convince anyone to stay. The resort was established at the same site of a previous popular girls’ camp known throughout the region. On account of this, conserving the natural mountain environment is a goal and value the resort takes pride in sustaining. No one can deny that this area of Western NC radiates a unique feel, and Yonhalossee is a perfect place that reflects that. If you want to live in a charming haven where all four seasons shine, you’ve found your place.